Thousands of Honduran migrants hoping to reach the U.S. stretched out on rain-soaked sidewalks, benches and public plazas in the southern Mexico city of Tapachula, worn down by another day’s march under a blazing sun. Keeping together for strength and safety in numbers, some huddled under a metal roof in the city’s main plaza Sunday night. Others lay exhausted in the open air, with only thin sheets of plastic to protect them from ground soggy from an intense evening shower. Some didn’t even have a bit of plastic yet. Adela Echeverria, 52, a single mother of three, teared up as she spoke about her plight. The group’s advance has drawn strong criticism from President Donald Trump, who lashed out again Sunday at the Democratic Party over what he apparently sees as a winning issue for Republicans a little over two weeks ahead of midterm elections. In another tweet, he said the migrants would not be allowed into the United States. 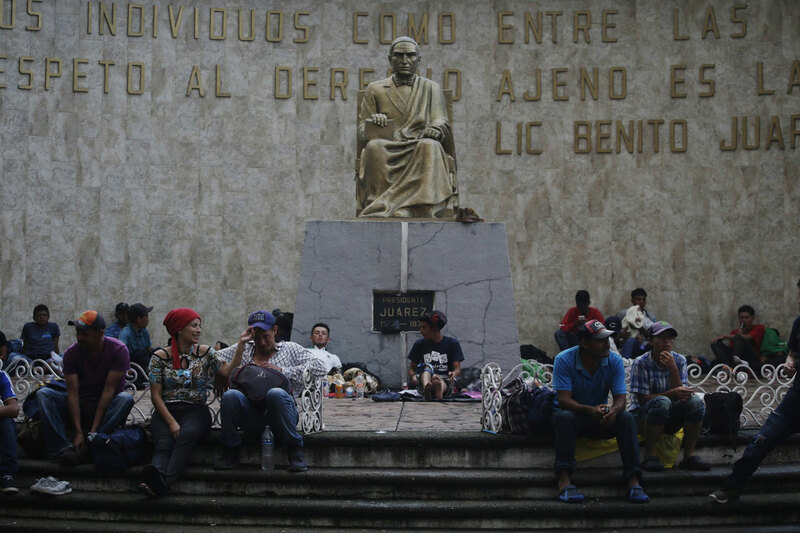 Mexican President-elect Andres Manuel Lopez Obrador suggested Sunday that the United States, Canada and Mexico work out a joint plan for funding development in the poor areas of Central America and southern Mexico. “In this way we confront the phenomenon of migration, because he who leaves his town does not leave for pleasure but out of necessity,” said Lopez Obrador, who takes office Dec. 1. The migrant caravan, which started out more than a week ago with less than 200 participants, has drawn additional people along the way and it swelled to an estimated 5,000 Sunday after many migrants found ways to cross from Guatemala into southern Mexico as police blocked the official crossing point. Later in the day, authorities in Guatemala said another group of about 1,000 migrants had entered that country from Honduras. 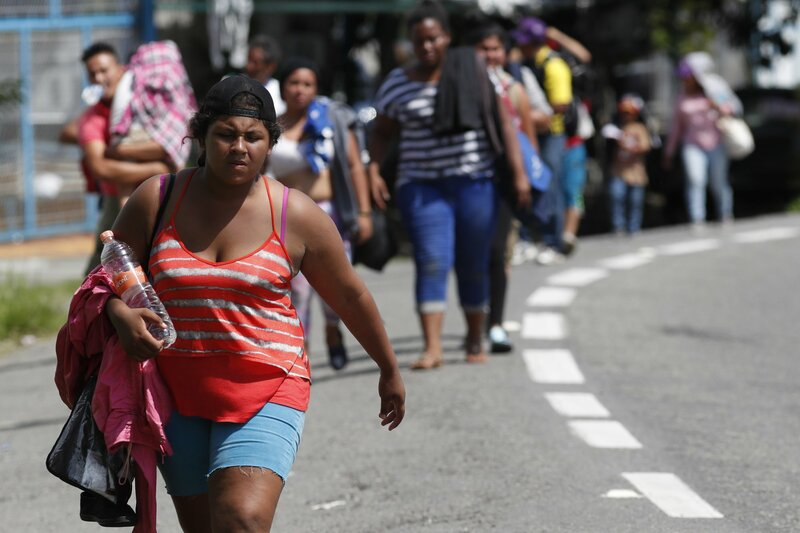 In interviews along the journey, migrants have said they are fleeing widespread violence, poverty and corruption in Honduras. The caravan is unlike previous mass migrations for its unprecedented large numbers and because it largely began spontaneously through word of mouth. Migrants received help Sunday from sympathetic Mexicans who offered food, water and clothing. Hundreds of locals driving pickups, vans and cargo trucks stopped to let them clamber aboard. Civil defense officials for Mexico’s southern state of Chiapas said they had offered to take the migrants by bus to a shelter set up by immigration officials about 5 miles (7 kilometers) outside Tapachula, but the migrants refused, fearing that once they boarded the buses they would be deported. Ulises Garcia, a Red Cross official, said some migrants with injuries from their hard trek refused to be taken to clinics or hospitals, because they didn’t want to leave the caravan. Garcia said he had seen cases of swollen, lacerated and infected feet. But “they are going to continue walking, and their feet won’t heel as long as they keep walking,” he said. Jesus Valdivia, of Tuxtla Chico, Mexico, was one of the many who pulled his pickup truck over to let 10 or even 20 migrants hop in at a time, sometimes causing vehicles’ springs to groan under the weight. Passing freight trucks were quickly boarded by dozens of migrants, and straining tuk-tuks carried as many as a half-dozen.